Unilock is the most advanced preset system in the world that differs completely from any other system used until now. Those differences are defined by the "Summary of the invention" of our U.S. Patent No.6668584. 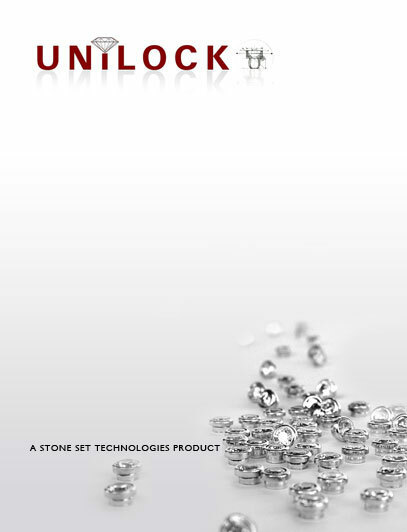 The utilization of the Unilock on setting gems is without restrictions. Essentially, any preset gem into the Unilock is easily used over any metal, material or product as fast as a nail is used in construction work, but with precision, quality and reliability never achived by any other gem setting system. Today the Unilock makes it possible to set gems into the hardest non-solderable jewelry material and into any gift products as well. The Unilock boasts a range of applications that are unlimited from Jewelry to Fashion, making it "The Ultimate Jewelry Element of Personalization."